Winter fishing can be miserable and cold, and you should always be on the lookout for signs of hypothermia. Cold weather is not far away, and every angler should be prepared for the challenges that the late season and winter fishing can create. Hypothermia is a serious threat in fall and winter because of two crucial elements: water and dropping air temperatures. Hypothermia happens when you lose body temperature faster than the body can produce heat, resulting in a dangerously low body temperature. Hypothermia is most often caused by exposure to cold weather or immersion in a cold body of water. Think tailwaters in December in January. So picture this scenario: Your buddy is going to make that cast to try and get just a bit closer to the bank upstream. With the stretch, though, at the end of his cast, his foot gets a little sideways on the icy rock, and he takes a plunge into the Blue River. He feels the water slosh in his waders, and his fleece and long johns are wet. But you don’t have to fall in to be in danger. Let’s say that you decide to stay out for “just one more cast,” and over the next hour, the temperature begins to drop. Hypothermia can begin to occur if you are out in the cold long enough and maybe you just skimped a little layers of clothing that day. Your body starts to shiver as the sun drops lower in the sky. The body is trying to warm itself, so you start to shiver. It’s the first thing you will probably notice about your buddy. Someone with hypothermia usually is not aware of his or her conditions and that the symptoms are worsening because the changes can be so gradual. The confused thinking counteracts any self-awareness. “As with most safety issues, the best approach is prevention, and a little preparation goes a long way,” says Neil Luehring, a retired Captain from the Colorado Springs Fire Department. Protect the person against wind, drafts, and further heat loss with warm, dry clothes. Begin rewarming the person with extra clothing. Use warm blankets. Vince Puzick is the Content Manager for Angler’s Covey in Colorado Springs, Colorado. Neil Luehring is a fly-fishing guide at Angler’s Covey, as well as a retired captain on the Colorado Springs Fire Department. What about when your down stream a way from your truck or camp ? 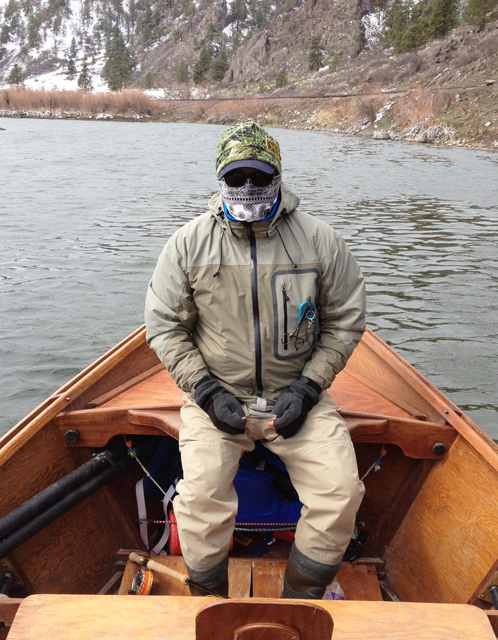 Preparing for extreme temps when winter fly fishing is a very real concern. I love everything about fly fishing in the winter, the solitude and adventure are what gets me out. But recognizing recognizing when you’re your pushing the limits of safety needs to be in the fore front. The most important thing that the reader should take away from this article is that the affected person will not be able to recognize they are suffering from Hypothermia. It will be the friend of the victim that will recognize it. In all probability, the victim will have difficulty in treating themselves.